A few days ago we brought you the latest results of our Refer-A-Friend program. The average earned bonus was €168 and our highest earned bonus by referring investor to date is €1,534. 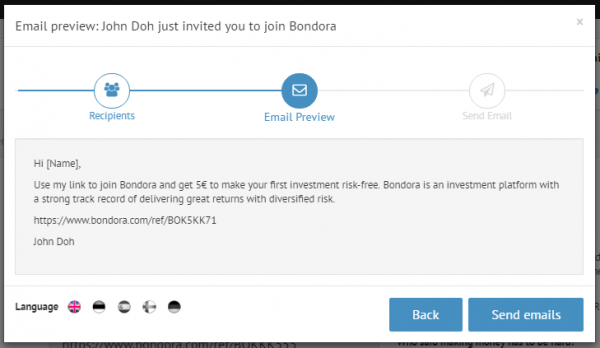 In this post we’ll provide a quick overview of how you can get started fast using our simple “Invite by Email” feature. Show your friends how easy it is to generate returns with marketplace lending. From your investor Dashboard, click on the “Refer-A-Friend” tab. You’ll be directed to a view where we’ll provide you with an personalized referral link. Here, click on the “Invite by Email” button to start sending invitation email(s). 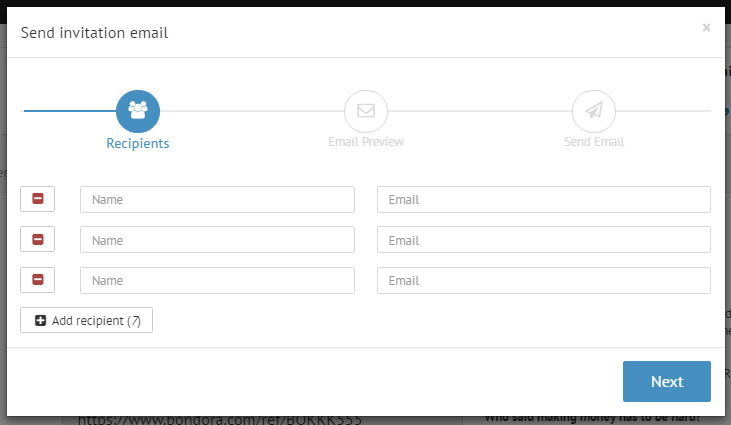 In the popup window, you can enter one or multiple email recipients by filling in the name and email address fields. It is possible to add up to 10 recipients in one email batch. When you’re ready, click “Next“. In the final step, you are presented with the preview of the email subject and content that will be sent out to the recipients. Here you can also choose the language for the invitation email. The supported languages are english, estonian, spanish, finnish and german. When you’re ready, just click “Send emails” and you’re done. Remember, When you refer a friend, you get 5% of everything they have invested over the first 30 days. You get paid inside 20 business days after their first 30 days on the site. As long as your friend invests at least 10 EUR and follows our terms and conditions, the money is yours. The more people you invite the greater your earnings potential.